The gastronomy of Alicante is largely based upon the Mediterranean Sea because of its close proximity. Therefore fish is an important part of their diet. Rice, as well, is prevalent in many of Alicante's dishes; this can be linked to the Muslim roots in the culture of Alicante. Along with the sea, Alicante is known for having fertile land that allows for fruits and produce to be farmed and consumed locally. 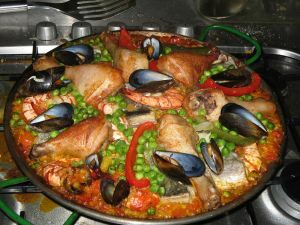 Add in the use of olive oil to round out this truly Mediterranean diet which is common in Alicante. One of the most famous dishes, evolving from the abundant use of rice in Alicante, is paella. Customarily, it's composed of rice with chicken or rabbit, or both. Garlic accompanies the oil in flavoring the sauce. Some vegetables and possibly shellfish are added to garnish the dish. Of course, these ingredients can vary according to individual tastes. Along with paella there are hundreds of other rice dishes in this region. A great way to sample some other flavors would be to try eating at an arroceria, which is a restaurant explicitly serving rice dishes. Much like the rest of Spain, tapas are a great way to taste a medley of local or national delicacies. You will find several places to have tapas while out on the town. In Alicante you may see many tapas with arroz, this means it has rice. After you've feasted on all the fresh vegetables and seafood you may want to taste some of the fresh fruits grown right in Alicante, such as the cherries, oranges, or grapes. In fact, the Spanish tradition of eating 12 grapes along with the chimes of the clock in the countdown of New Year's Eve was born in Alicante, in 1909, because there was a surplus of grapes that year. If you happen to be in Alicante or Spain in general, around Christmas try turrón which is a sweet varying in tastes, but normally of almonds and honey. This is made in Jijona, a town in the province of Alicante.